Sequels. What is a film to do when it is bound by its narrative and more compellingly, by its box office to generate an offspring to match and surpass the blockbuster film that spawned it? 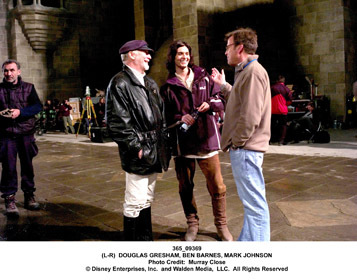 Has director Andrew Adamson succeeded in raising the bar with Prince Caspian, the sequel to 2005’s mega-hit The Lion, The Witch and The Wardrobe? The answer is a definite yes and no. 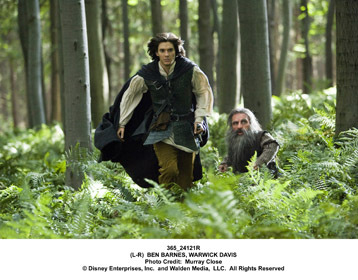 I remember having viewed the prospect of a live action movie of The Lion, The Witch and The Wardrobe with a hint of side-eye. Besides not having read C.S. 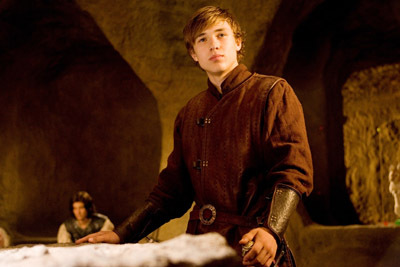 Lewis’ beloved 7-book series The Chronicles of Narnia, I have to admit to being traumatised by the unexpectedly dire and freaky 70’s animated TV version by Bill Melendez, the director/producer of the classic Peanuts cartoons (- and voice of Snoopy!). Once I overcame those prejudices, I was utterly taken by the world created by Adamson and his young cast of unknowns. 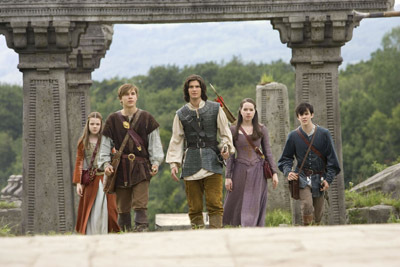 They succeeded in capturing the magic and mythos of this fantasy world through the wardrobe while introducing us to the Pevensie siblings, who, by film’s end we feared and cheered for. 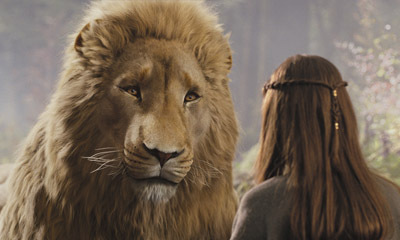 Little sister Lucy’s interactions with Narnia’s saviour, the lion Aslan and other green screen creatures were touching and endearing. 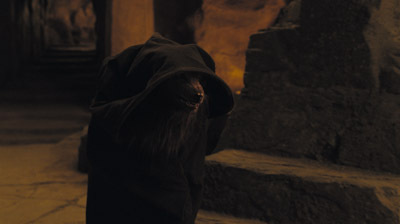 In a bit over two hours, the young Pevensies learned lessons about loyalty, faith, and how to wage one heck of a war courtesy of the Narnian denizens, both two and four footed. 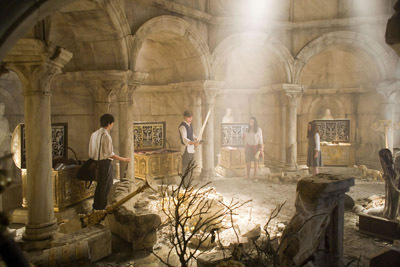 Would they be as engaging on their second visit to Narnia? 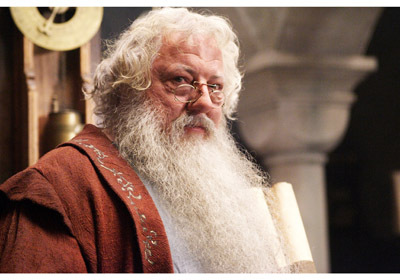 The story opens far from the Pevensies with a birth. 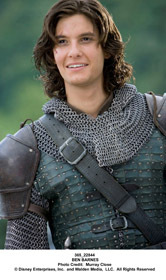 The advent of a male child brings a threat to the life of Prince Caspian, whose ascension to the throne of his Telmarine people is now in serious doubt. 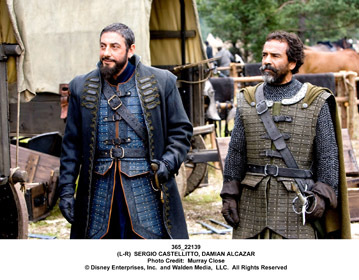 The baby’s father is the devious Miraz, acting regent and uncle of Caspian who now sees his nephew as one prince too many. 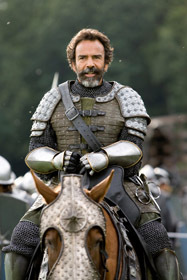 With the help of a faithful servant, Caspian is smuggled out of the castle with his uncle’s troops in hot pursuit. 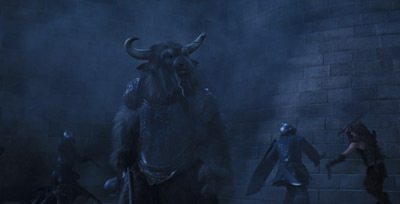 When Caspian escapes into the forbidden forest of Narnia, he comes across some allegedly mythical creatures that frighten him into blowing the horn given to Narnian Queen Susan Pevensie by Aslan, the sound of which resonates in all sorts of odd places, like World War Two London, f’rinstance. In Londinium, our old friends the Pevensies are navigating the Underground in school uniforms and not adapting particularly well to life after Narnia. Well, how would you feel coming back to school ties and exams after defeating the forces of evil and being made king of all manner of mythical beast? Exactly. 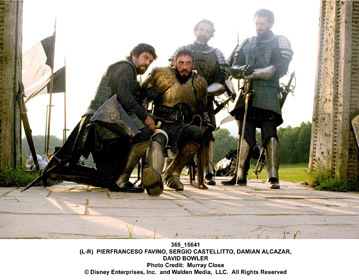 When we see the two brothers, eldest Peter and dry-witted Edmund mixing it up with a bunch of schoolmates, one gets the idea it’s nothing new. However, on this day, instead of the tube coming to shift the children to their lessons, the tube shifts the children back to Narnia. 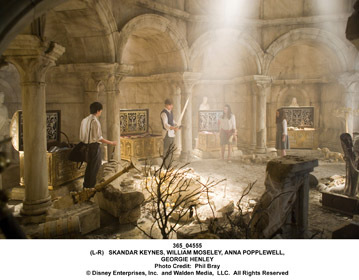 The horn blown by Caspian has brought the Kings and Queens of Narnia back to their kingdoms, except nothing is like they remember, “I don’t remember any ruins in Narnia,” ponders Edmund after the Pevensies’ exploration reveals a destroyed land very unlike the place of joy and colour they left. 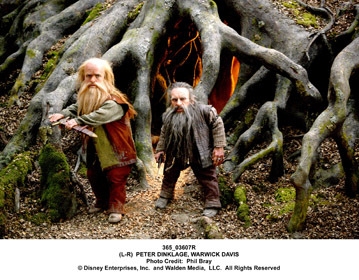 Their first encounter in Narnia is with a cynical dwarf called Trumpkin, who lives in virtual hiding in the forest. 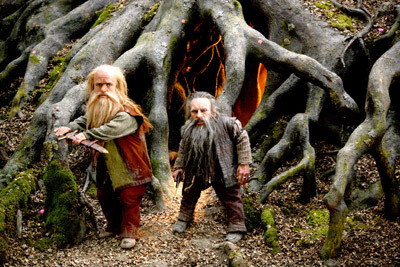 Trumpkin reveals to the Pevensies that they indeed are in the Narnia they left a year ago, only in Narnian time over 1,300 years have passed. 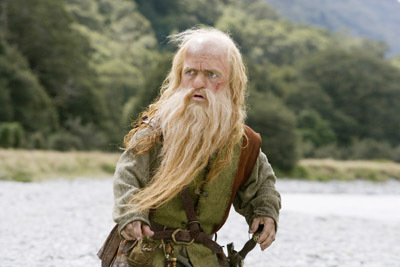 In wars against the Telmarines and other human forces, only a few creatures of old Narnia have survived the destructive onslaught and Aslan has retreated into myth. 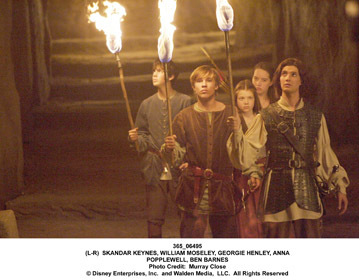 Peter leads the Pevensies to take up the cause of the Narnians and take back the land from the avaricious Telmarine king. 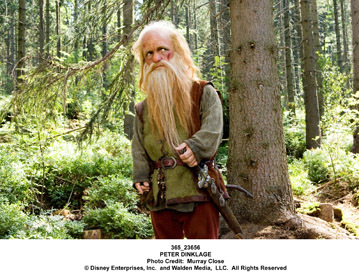 Once in the rebel stronghold, the Pevensies meet Caspian, who has already gathered a group that includes centaurs, griffins, dwarves, minotaurs and feisty mice to dethrone his murderous uncle and take back his kingdom. 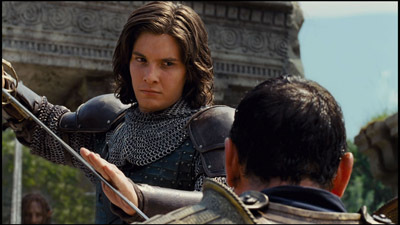 What sets Prince Caspian most apart from its predecessor is the incredible amount of action once the film gets moving. 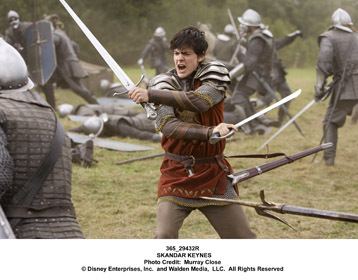 There was a great battle sequence in The Lion, The Witch and The Wardrobe which looks quite brief compared to the excitement of the new film. 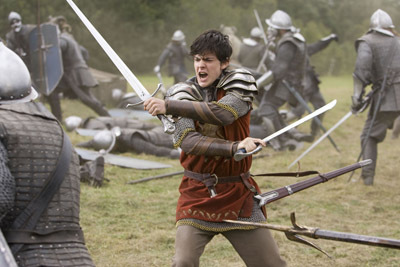 Each of the Pevensies, now being older, have brought their “A” battle games with them; a duel early on between Edmund and Trumpkin shows they’ve been keeping in practise. 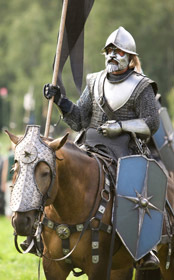 Peter’s ill-advised raid on the Telmarine castle and the revenge by King Miraz has some thrilling moments like the first troop of Narnians flying silently over the castle keep in the claws of griffins. 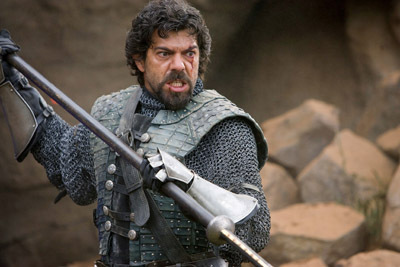 Peter has stepped up and can best a man at full-armoured hand-to-hand combat like any knight of old. 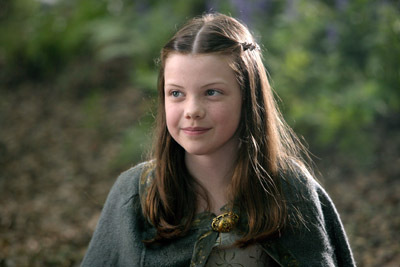 Susan has my vote for most improved in the film in every way; she has become a true warrior and queen in this chapter. 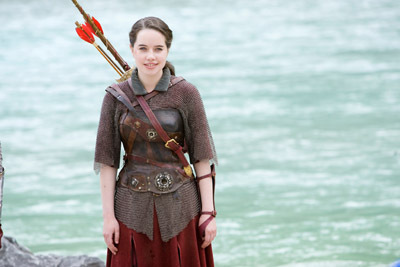 She wields her bow and arrow and in a change from the last film, doesn’t hesitate to use it, bringing down enemy after enemy. 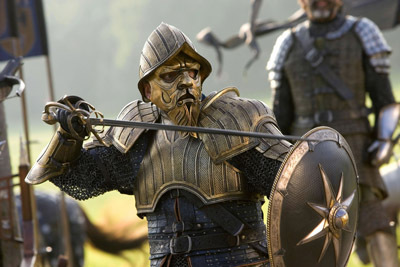 The climactic war against the Telmarines takes the scope of the battle sequences of Braveheart and at no time can the audience be sure who will be victorious. 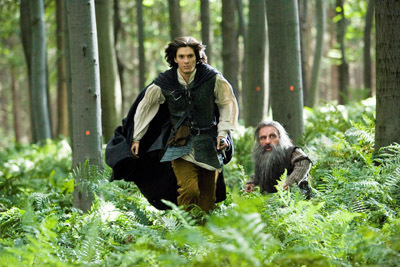 For all the action in Prince Caspian, most of its problems lay in the erratic and unfortunate pacing of the picture. The first act drags mercilessly and I wondered if there wasn’t some studio moratorium that the sequel had to be as long as its predecessor? There’s not really a ton of work to reestablish the characters and unlike the first film, you don’t have a bunch of new faces to introduce, which may also be part of the problem. The discovery of the faun, Mr. Tumnus, the Beavers, the fox and the other talking animals was a delight, and Tilda Swinton, fabulously chomping scenery by the armload as the White Witch. never gave the audience a come down moment, there was always something to grab the attention. 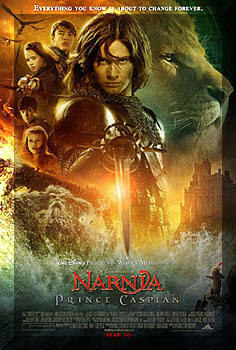 A lot of the magic of the original film just isn’t here as we are now dealing with very human problems; King Miraz is a greedy git, Prince Caspian needs to find his strength to lead Narnia to a better world and Peter Pevensie has to find the humility to give up the leadership he so dearly loves to Caspian, his rival in more ways than one. That story shouldn’t have taken over two hours to tell. Even a fabulous cameo by Swinton’s Witch Witch tempting Caspian with an offer he can’t refuse is only a temporary spark in a film that needs many more to keep it afloat. 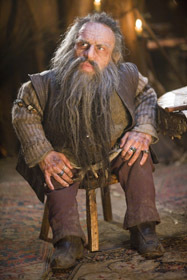 Sadly, the villain in Prince Caspian isn’t as compelling or riveting as Swinton’s. 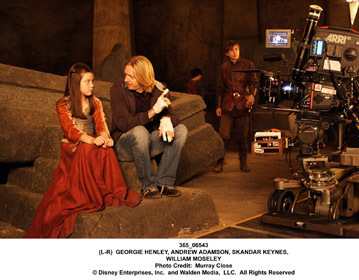 My other issue was with Prince Caspian’s special effects which weren’t quite as special this go round. 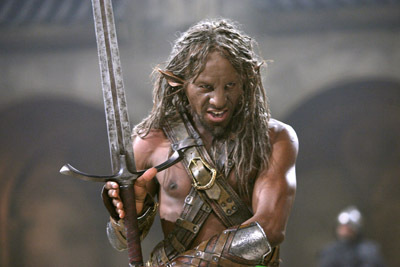 There is some nice battle stuntwork, beautiful cinematography and a few sparkling scenes like those with the griffins and a nifty Ten Commandments homage toward the end of the Telmarine war, but odd things like the strange, clumsy way the centaurs now move and the pasted-on foam rubber body hair made them look more like something from the Hercules and Xena TV shows than the regal, flawlessly rendered creatures from the previous film. 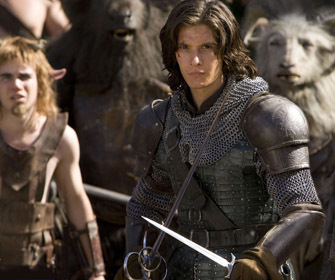 Good thing the performances are so much better in Prince Caspian. 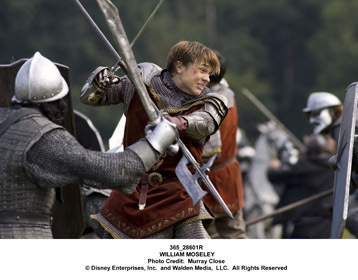 The collective acting skills of the Pevensie children, played by William Moseley, Anna Popplewell, Skandar Keyes and the adorable Georgie Henley, have come a long way since 2005, and all are wonderful here, engaged and engaging. Moseley is ready to be the next Errol Flynn with his dashing feats of swordfight daring, and Popplewell strikes the right note of motherly maturity without the annoying wet blanket tone she struck in the first film. 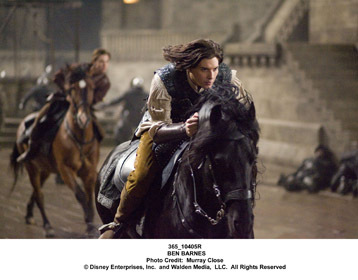 You absolutely believe the change in Susan and her romance with Prince Caspian is a lot of fun to watch. 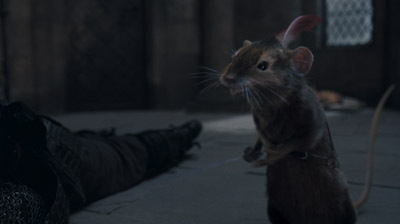 The supporting cast, namely Peter Dinklage as Trumpkin, Warwick Davis as the not-as-benevolent dwarf, Nikabrik and the hilarious voice-over of the swashbuckling mouse captain, Reepicheep, are perfect and add much-needed comic lightness to this darker chapter. 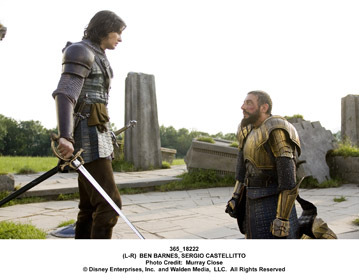 As for Prince Caspian himself, Ben Barnes admirably conveyed the uncertainty and bewilderment of the young King-to-be who had no belief in himself, I only wish he’d had more to do than look worried and doubtful. 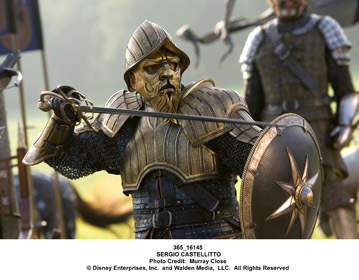 His acceptance of his fate isn’t the great epiphany we’re looking for, but I think we’ll see a stronger character in the subsequent chapter, Voyage of the Dawn Treader. 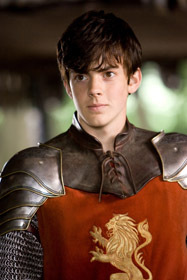 I was so sorry to see so little from the fabulous Skandar Keynes, who was so great in the first film. Keynes’ flair for dry, acerbic line readings gave this new chapter some of its funnier moments. 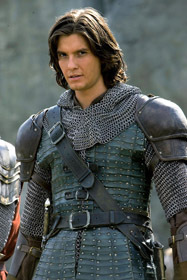 Prince Caspian is a transitional chapter and as such, a lot of the things we loved in the first film are gone and we are told we will lose more touchstones before the next chapter. It’s a tricky thing to hold the interest of the younger set who loved 2005’s movie and move the story into the darker, more mature waters of this film and the next. Much of the stuff here is more intense and the battle violence may be a bit rough for the wee ones who may be expecting more adventures with the gentle Mr. Tumnus, but it is terribly entertaining. 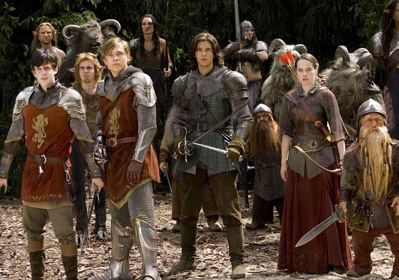 That action combined with a big step up in the performances of the cast make The Chronicles of Narnia: Prince Caspian a fun, if unequal sequel. 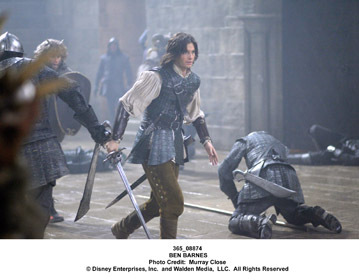 Click here for our 2008 New York Comic Con interview with Prince Caspian himself, Ben Barnes.